Learn how to carefully evaluate the certificate, cut, colour, clarity and carat before purchasing your perfect diamond. These are known as the 5Cs of diamond grading. A diamond certificate is the primary tool which enables you to separate the great diamonds from the rest before confirming its visual beauty. The diamond is evaluated, measured, and scrutinized using trained eyes, a jeweller’s loupe, a microscope, and other industry tools. A completed certificate includes an analysis of the diamond’s dimensions, clarity, colour, polish, symmetry and other characteristics. The most reputable and respected grading lab in the world is the Gemological Institute of America (GIA). There are other labs such as EGL, HRD, IGI, etc but be aware that they all don’t grade as accurately and consistently as GIA. EGL grades about 3 – 5 color grades and 1-3 clarity grades off from GIA standards. American Gem Society (AGS) Labs would be considered the next best alternative if you had to choose a grading lab other than GIA. It is important to know this because it affects price. Diamonds not graded by GIA should be priced lower as a result of these differences. Jewellers selling diamonds not graded by GIA should always operate ethically and disclose this information. The cut of a diamond refers not to its shape, but to the balance of proportion, symmetry and polish achieved by the diamond cutter. The extent of how well the diamond is cut is directly related to the diamond’s overall beauty. When a diamond has been correctly cut, the diamond’s ability to reflect and refract light is greatly enhanced. Cut is considered to be the most important of all of the diamond characteristics. BRILLIANCE – Brilliance refers to the white light that is reflected back to the eye from the diamond. Light enters through the top of the diamond (the table), is broken down into a rainbow of spectral colours and is reflected back and forth in the interior of the gem by bouncing off the mirror-like facets. Light exits through the table, recombining as white light. DISPERSION (FIRE) – Dispersion or fire is the rainbow of colours that are reflected back to the eye from the diamond. Light enters through the top of the diamond, is broken down into a rainbow of spectral colours and is reflected back and forth in the interior of the gem by bouncing off the mirror-like facets. When it leaves through the crown, it stays separated and reaches the eye in flashes of colour. SCINTILLATION – Scintillation is the play of light you see with movement of the diamond, demonstrated by sparkling on the diamond’s surface. A diamond is evaluated on its ability to reflect and refract light in all directions. A well-cut diamond will often appear larger than a poorly cut diamond of the same carat weight, and have the appearance of enhanced colour and clarity. The quality of cut is determined by how well the symmetry, polish and proportions of the diamond produce the most attractive balance of the three different types of reflection. Several proportion factors have the most immediate impact on a diamond’s ability to reflect light correctly. The table size and depth of a diamond relative to the diameter greatly impacts the light return from a diamond. A well-cut diamond is proportioned so that most of the light entering the gem exits back through the top of the stone, perfectly balancing the white light (brilliance) with intense flashes of fire (dispersion). A poorly-cut diamond, with facets cut only a few degrees out of alignment, can result in light exiting through the bottom of the diamond, known as light leakage, instead of from the top where it is visible. This creates a diamond with dulled brilliance from poor light performance within the gem, making the center of the gem look dark. The best cut diamonds have proportions that are within tried and true ranges known for maximizing brilliance, fire and scintillation. The cut grading scale for diamonds is based on the reflective properties of the diamond, according to these carefully calculated diamond measurements. It also allows you to easily identify a well-cut diamond, without having to assess each individual cut characteristic. We only list diamonds with a cut grade of good or better. EXCELLENT = Top 3% of diamond quality based on cut. Exquisite quality cut to create the optimal combination of brilliance and fire. Reflects nearly all light that enters the diamond. VERY GOOD = Top 15% of diamond quality. Superior quality cut that reflects nearly as much light as the ideal cut while at a substantially lower cost. GOOD = Top 25% of diamond quality. Premium quality cut to optimize the size without sacrificing quality or beauty. Reflects most light that enters. FAIR = Top 35% of diamond quality. Adequate quality cut which reflects some light while maximizing weight. While not as brilliant as a good cut, still a quality diamond. POOR = Inadequate quality cut that reflects minimal amount of light. Colour refers to the natural body colour of a diamond, and not to the reflection of spectral colours that flash when a diamond moves. Most diamonds naturally exhibit slight hints of yellow, brown or gray. This colour is caused by natural trace elements of nitrogen that were present when the diamond formed under the Earth’s crust. The less colour a diamond exhibits, the higher the rarity, and therefore the higher the value. A diamond acts as a prism by dividing light into a spectrum of colours and reflecting this light as colourful flashes called dispersion or fire. Diamonds with less colour allow more light to pass, releasing more brilliance and fire. After cut, colour is generally considered the second most important characteristic when selecting a diamond. This is because the human eye tends to detect a diamond’s sparkle first, and colour second. D = Absolutely colourless. The highest colour grade, extremely rare and most expensive. E = Colourless. Only miniscule traces of colour can be detected by an expert gemologist in a controlled environment, a very rare diamond. F = Colourless. Slight colour detected by an expert gemologist, but still considered a colourless grade, a rare, high quality diamond. G-H = Near-colourless. Colour may be detectable compared to diamonds of better grades, but offers excellent value. I-J = Near-colourless. Colour slightly detectable when compared to diamonds of better grades, a good value. K-Z = Slight or obvious colour noticeable even to the untrained eye. Since diamonds are formed deep within the earth, under extreme heat and pressure, they often contain unique birthmarks, either internal (inclusions) or external (blemishes). Diamond clarity refers to the absence of these inclusions and blemishes. Diamonds without these birthmarks are rare, and rarity affects a diamond’s value. Expert graders assign diamonds a clarity grade that ranges from flawless (FL) to diamonds with obvious inclusions (I3). Every diamond is unique. None are absolutely perfect under 10× magnification, though some come close. Known as Flawless diamonds, these are exceptionally rare. Much is made of a diamond’s clarity, but of the Four Cs, it is the easiest to understand, and according to many experts, generally has the least impact on a diamond’s appearance. The GIA Clarity Scale contains 11 grades, with most diamonds falling into the VS (very slightly included) or SI (slightly included) categories. In determining a clarity grade, experts consider the size, nature, position, colour, and quantity of clarity characteristics visible under 10× magnification. We only list diamonds of SI2 clarity and higher. FL = Flawless. No inclusions or blemishes are visible to a skilled grader using 10× magnification. IF = Internally Flawless. No inclusions and only blemishes are visible to a skilled grader using 10× magnification. VVS1 and VVS2 = Very Very Slightly Included. Inclusions are difficult for a skilled grader to see under 10× magnification. VS1 and VS2 = Very Slightly Included. Inclusions are clearly visible under 10× magnification but can be characterized as minor. SI1 and SI2 = Slightly Included. Inclusions are noticeable to a skilled grader using 10× magnification. I1, I2, and I3 = Included. Inclusions are obvious under 10× magnification and may affect transparency and brilliance. This is the diamond’s physical weight measured in metric carats. 1 carat equals 0.2 grams and is subdivided into 100 points, just as a dollar is divided into 100 pennies. 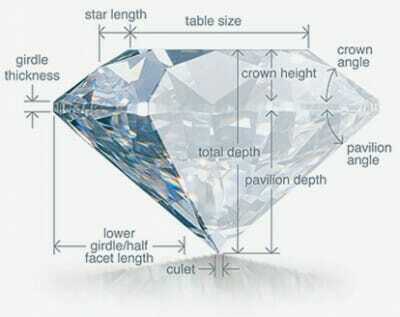 Carat weight is the most objective of the diamond’s 5Cs. It involves no estimates, comparisons, or judgments. All that is required is a precisely balanced scale capable of weighing extremely small weights. Yet, despite the ease of measurement and the relative unimportance of diamond weight, there are some facts you should understand about weight and price. Comparing the value of diamonds by weight is like comparing the value of paintings by size. A wall-sized canvas by an unskilled artist may be bigger than a miniature by van Gogh, but it will not be worth more. Large diamonds are rarer than smaller ones, and as the carat weight increases, the value of the diamond rises. However, the value increase is not proportionate to the size increase. For example, a one-carat diamond will cost more than twice that of a 1/2-carat diamond (assuming colour, clarity, and cut grade are identical). Weight does not always enhance the value of a diamond, either. Two diamonds of equal weight may be unequal in value, depending on other determining factors such as cut, colour, and clarity. In fact, if a diamond is improperly cut, the added weight may serve only to reduce its brilliance.